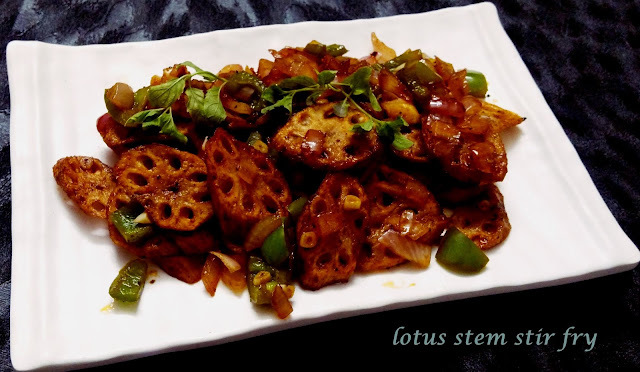 Deep fry lotus stem in hot oil till they turn golden brown and crispy from all the sides. Drain on an absorbent paper and keep aside. Heat 2 tbsp oil in a broad non-stick pan add garlic,chili, onion and capsicum and stir for a while till they become tender. Add honey, chili sauce, tomato ketchup, soy sauce,pepper and salt, mix well and cook on a medium flame for 1 minute. Add the fried lotus stems and cornflour slurry . Toss well and cook on a medium flame for 1 minute.